2015 “Russia as a Recruited Development Donor.” European Journal of Development Research (2015) 27, pp. 273–288. doi:10.1057/ejdr.2014.34. 2011 Gray, Patty A. 2011. Looking “The Gift” in the mouth: Russia as donor. Anthropology Today, Vol. 27, No.2, April 2011. This was reprinted in Introductory Readings in Anthropology, ed. by Hilary Callan, Brian Street and Simon Underdown. Oxford: Berghahn Books. 2013 “Russia’s Participation in Development Cooperation”, UNESCAP – China Agricultural University Seminar on East and North-East Asian Development Cooperation in Post-2015, Beijing, China, June 2013. “Russia’s Evolving Foreign Aid programme”, Rising Powers in International Development Seminar Series at the Institute for Development Studies, University of Sussex, April 2013. 2012 “The BRIC View: Russia”, roundtable in the plenary session of the Society for International Development Annual Conference on alternative approaches to development , Washington, D.C., June 2012. “The changing landscape of development assistance: Russia as a (re)emerging donor”, Anthropology Research Seminar, Queen’s University Belfast, February 2012. 2011 “Emerging Donors and the Changing Landscape of Foreign Aid: Where Does Russia Fit?” A Future for Aid Data, workshop hosted by the University of Birmingham International Development Department, November 2011. 2010 “Changing Vectors of Development: Russia as a Donor of International Aid”, Seminar Series of the Centre for the Study of Wider Europe, National University of Ireland Maynooth, April 2010. 2014 “Past Animosities and Present Skepticisms in Russia’s Current International Development Assistance Program”, 46th Annual Convention of the Association of Slavic, East European and Eurasian Studies, San Antonio, TX, November 2014. “Russia’s Role: Partner or the Bear in the Shadows?” Presentation in the roundtable “Europe, the European East, and Eastern Europe: Shifting Reference Points and Agendas in International Development Assistance”, Seminar Series of the Centre for the Study of Wider Europe, National University of Ireland Maynooth, March 2014. 2013 (with Jennifer Murphy) “Developing Development (Education) in Russia”. Presentation in the roundtable “New Donors in Education: Russia’s contribution to Post-2015 Development” at the 12th UKFIET International Conference on Education and Development, Oxford, England, September 2013. “Being the ‘R’ in BRICS: Russia’s solidarities and anomalies”. Paper presented at the 17th World Congress of the International Union of Anthropological and Ethnological Sciences, Manchester, England, August 2013. 2013 “The Arctic is the ‘Global South’: Dragging the North and Siberia (kicking and screaming) into the Anthropology of Development”. Paper to be presented at the 10th Congress of Russian Ethnographers and Anthropologists, Moscow, Russia, 2-6 July 2013. 2012 “Russia as a Re-emerging Donor: Towards a Phenomenology of Development Donorship.” Paper presented at the 110th Annual Meeting of the American Anthropological Association, San Francisco, CA, 17 November 2012. “Beyond EU Expansion: On Russia as a Recruited Donor and ‘Donor Expansion’.” Paper presented at the 9th Convention of the Central and East European International Studies Association (CEEISA), Jagiellonian University, Krakow, 20-22 September 2012. “Russia as a re-emerging donor: Toward a phenomenology of development donorship”. Paper presented at the 12th Biennial Conference of the European Association of Social Anthropologists, Nanterre, France, July 2012. 2011 “‘Emerging Donors’ and the Changing Landscape of Foreign Aid: Public Perceptions of Development Cooperation in Russia.” Presentation for a seminar at the School of Oriental and African Studies, London, 17 June 2011. 2010 “Russians (re-)emerging as donors: Volunteerism, The Gift, and the race not to be ‘Third World’”. Paper presented at the 109th Annual Meeting of the American Anthropological Association, New Orleans, LA, 17-21 November 2007. “Changing Vectors of Development: Russia as Donor”. Paper presented at the Annual International Conference of the Royal Geographical Society Institute of British Geographers, London, 1-3 September 2010. “Changing vectors of development: locating Russia in development discourse and practice”. Paper presented at the VIII World Congress of the International Council for Central and East European Studies, Stockholm, Sweden, 26-31 July 2010. 2009 “Changing vectors of development: Locating Russia in development discourse and practice.” Paper presented at the 41st National Convention of the American Association for the Advancement of Slavic Studies, Boston, MA, 12-15 November 2009. 2014 “The Changing Landscape of Development Assistance and Foreign Aid: Is the Cold War Really Over?” at the 46th Annual Convention of the Association of Slavic, East European and Eurasian Studies, San Antonio, TX, November 2014. (With Ela Drazkiewicz and Alessandro Iandolo) “The changing landscape of the global political economy and foreign aid: has the Cold War ended?” at the 13th Biennial Conference of the European Association of Social Anthropologists, Tallinn, Estonia, July-August 2014. 2012 “‘Emerging Donors’ in International Development: Border Crossings between Recipient and Donor” at the 110th Annual Meeting of the American Anthropological Association, San Francisco, CA, November 2012. “The anthropology of ‘emerging donors’ and the uncertainty of developmental futures” at the 12th Biennial Conference of the European Association of Social Anthropologists, Nanterre, France, July 2012. 2009 “Who Gets to Give? Eastern Europe and Russia in the Global Community of Donors and Receivers” at the 41st National Convention of the American Association for the Advancement of Slavic Studies, Boston, MA, November 2009. 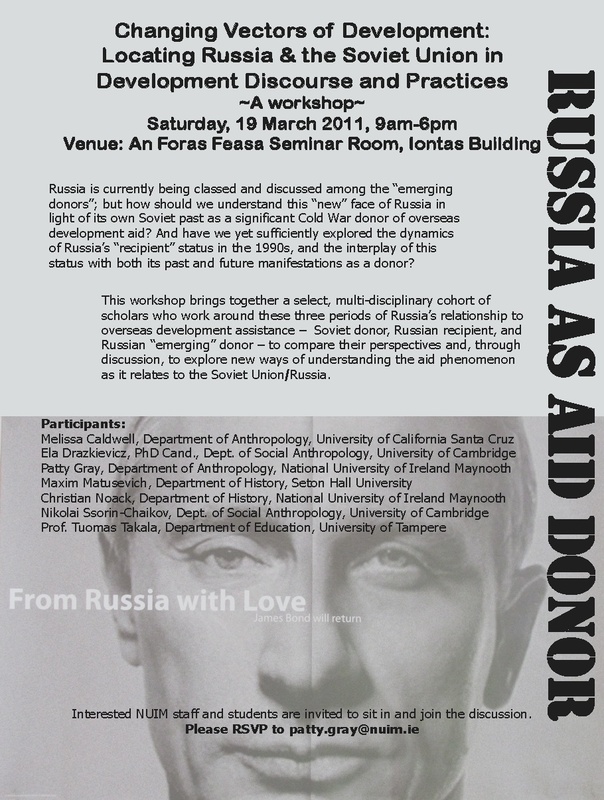 On 19 March 2011, 7 scholars came together from the U.S., Ireland, Finland and the U.K. all of whose work touches upon the topic of the international aid activities of Russia and/or the Soviet Union, and in particular the role of Africa in these activities. The workshop was hosted by Dr. Patty A. Gray and was held on the campus of the National University of Ireland Maynooth. The purpose of the workshop was to explore Russia’s changing position in the global context of development aid by comparing several different perspectives: disciplinary (Anthropology, History, Education); temporal (Soviet era, contemporary Russia); and the different directional flows of aid (Soviet Union/Russia as an aid donor, Russia as an aid recipient). It was an opportunity for the few scholars in the world who are exploring such issues to become acquainted and share ideas, creating a conversation around our scholarship and through one another to widen our scope on the topic, and to explore possibilities for future collaboration. Full list of participants is available here as a pdf. 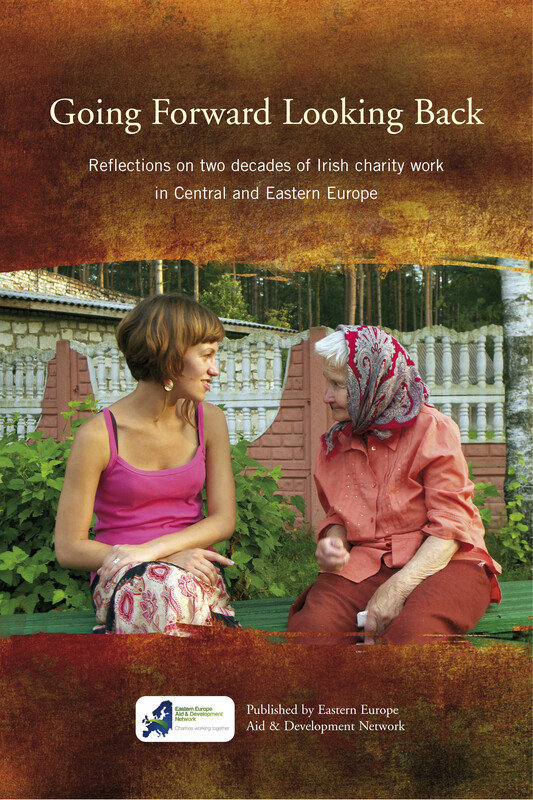 Patty Gray collaborated with Francis Haworth, Coordinator of the Eastern Europe Aid and Development Network (EEADN), to produce the book Going Forward Looking Back: Reflections on Two Decades of Irish Charity Work in Central and Eastern Europe, which was published in February 2011.Gray consulted with Haworth in the planning of the interviews, carried out four of the 34 interviews, and copyedited the final manuscript; Haworth carried out the bulk of the interviews, arranged for transcriptions of the interviews, and edited the transcriptions into short, readable stories that captured the essence of each narrator’s experiences. Local press on the launch of the book in March 2011. In 2011, The Comber Foundation became the first Irish charity to win the prestigious United Nations Online Volunteering Award. Eight online volunteers transcribed more than forty hours of audio interviews with development workers and volunteers, who over the past twenty years have dedicated themselves to helping the most vulnerable citizens in Eastern Europe. These interviews formed the basis of the book.